Self-proclaimed geography nerds Frances and Patrick planned to get married in this here city of Los Angeles, where the two had first met. For the invitation to family and friends, they wished to highlight places of note – ones that held significance to them as well as others to recommend to their visiting wedding guests. With a palette built around the wedding colors (peachy orange and pale green), a tri-fold map of Los Angeles landmarks was created to function as both invitation and "geographical" reference. 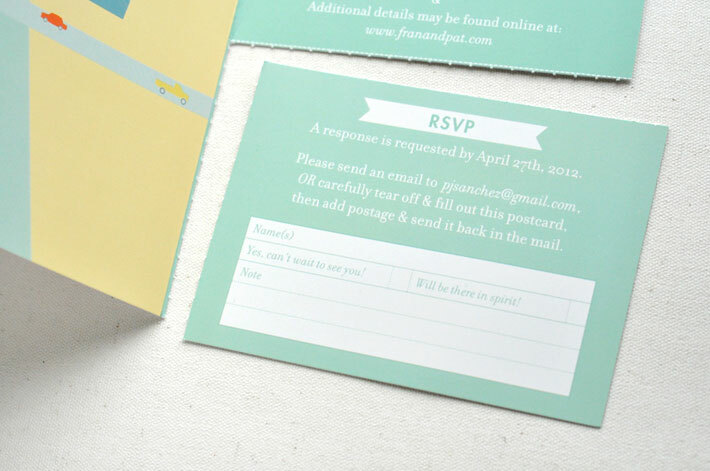 Event details were laid out along the side, with a tear-out RSVP postcard at the bottom corner. Pages from Patrick's old atlases were sewn into cozies for the poster invitations. The Fratrick wedding was featured on Ruffled.